Since the first time man peeked out of his cave and looked up at birds, he has wanted to fly. I realize that I just made all that up, but since all the Neanderthals are dead – no one around can prove me wrong and besides, I heard something like than on Discovery Channel – so it must be true. In any case, even I have dreamed of flying, as soggy as I am most of the time all dressed up as a Aquanaut with generally no where to fly to or from underwater. 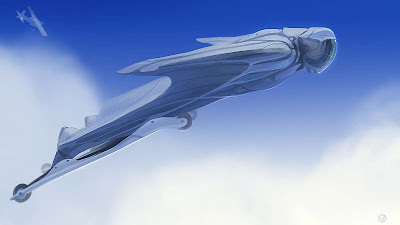 But right at the dawn of the 21st century – mankind has nearly solved the problem of flying men. I am not making this up…. This is all in the skydiver’s realm right now, but some fantastically talented skydivers have invented a skydiving ensemble called a “wingsuit”, invented in the 1990’s by Patrick de Gayardon. 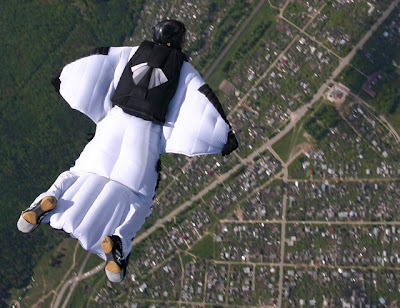 This wingsuit consists of fabric attached between the legs and under the arms so that the skydiver ends up looking a lot like a flying squirrel. It does not defeat gravity, but it enables the body of the skydiver to extend his reach from near vertical fall to a bird-like horizontal fall. Look at his incredible, fantastic, amazing video and watch this amazing individual, Loïc Jean-Albert of France fall down the side of a mountain and even soar over the heads of skiers on the slopes! At this time in the state of the art, the skydiver jumps out of the aircraft or off the side of a cliff or building (it is called base jumping if not in an aircraft). The wingsuit allows the skydiver to soar horizontally as well as down until he gets close enough to pop his low altitude chute to make a safe landing. The problem is, the wingsuit builds up way too much horizontal speed (about 75 mph with today’s designs) to allow for a safe landing without a chute – at least today. As show in the photo at the top, the next generation of wingsuits will solve that problem and be able to lose the forward speed (flaps?) and allow the skydiver to land either on his feet or with an attached landing gear frame (as shown) without a parachute! We are just a single generation of improvements away from that, according to Loïc Jean-Albert and that it will take about $2 million in technical studies and trials to finally get there. South African wingsuit maker Maria von Egidy says she already has a design that will allow for a safe landing and is working on it. And, by the way, if you want to buy one of these for yourself, you can just by clicking here and getting out your credit card. Please wait 4-5 weeks for delivery.